Crowned! is the first Julia Dweck's book we read with my boy. The story is about a young fairy Quinn who dreams to become a Queen. And there is no reason why not. Queen is everyone’s favorite; she has pretty gowns and lots of jewelry to shine. Young fairy adventures start with research what is needed to be a Queen. First, Queen needs to have a royal look so Quinn makes herself nice clothes, then a young fairy learns how to move and dance. 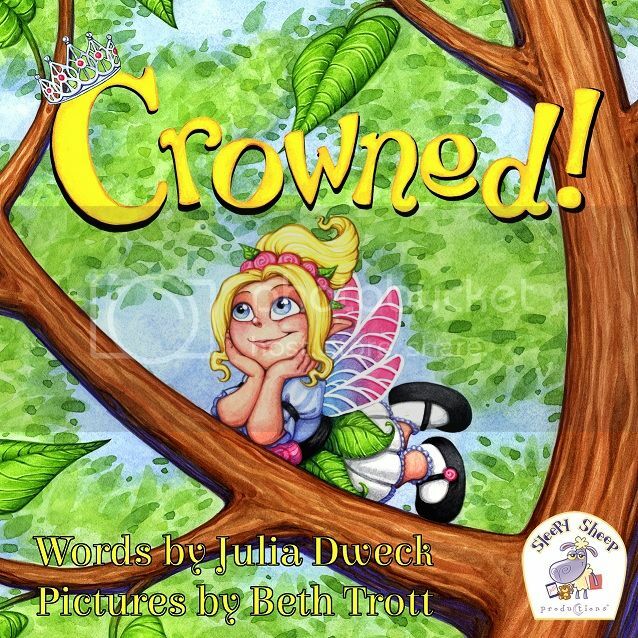 Being a smart girl, Quinn reads all the fairy tales and comes to the point that a prince or a king has to find her. Little Quinn tries to follow Sleeping Beauty path and bites every apple she finds in the forest, and then she kisses every frog in a nearby pond and tries many other things she learned from books, but nothing seems to work. Suddenly, she comes across a two head ogre, who is not very friendly and does not look like a prince either. No one is around to help little Quinn to fight against very cruel and monstrous ogre as she expected. Little fairy decides to stand up to ogre to prove herself that she is the Real Queen, no matter if the ogre does not think so. We liked reading this story about brave fairy Quinn, such a good example for young kids showing that not everyone has to be a Cinderella or have a prince to be a Queen. Every person has to create their own fairy tale and become the hero of the tale.